Pepper Construction is a leading provider of quality construction services in Chicago, Indianapolis, and the Midwest United States. They lead the industry in sustainable, lean, and virtual construction technologies. As early adopters of laser scanning, the team at Pepper immediately saw the value of the DPI-7 Kit as a powerful tool to bring laser scanning workflows to the job site and produce immediate results for a fraction of the cost of alternative methods. This past summer, Purdue University in Indiana contracted Pepper Construction for an 8-floor dorm restroom renovation project. The biggest challenge faced was the project timeline, with 8 floors of restrooms requiring renovation in less than 12 weeks. To ensure accurate and timely planning, Pepper coordinated the project with BIM, and ordered pre-fabricated assemblies for installation into each of the bathrooms. Without the time or resources to custom build each installation, much was riding on the pre-fabricated assemblies fitting into the renovation exactly as planned in the model. For this reason, Pepper found it imperative to verify the installations before assembly and delivery. While normally this verification would have proven both challenging and impractical, thanks to the DPI-7 it was quick, easy, and realistic to complete. 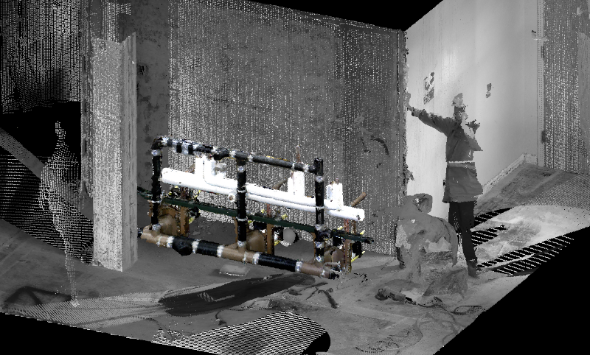 After a short trip to the mechanical shop where the pre-fabrication was taking place, Pepper scanned the assemblies in less than 15 minutes, instantly creating 3D point cloud models for direct comparison to the plan that was developed in the coordination model. In only another 5-10 minutes, these fresh scans were trimmed in Autodesk ReCap and brought into the Navisworks environment for analysis. This virtual installation procedure verified the pre-fab assemblies would fit exactly as planned, and Pepper was able to mass order them with confidence. The pieces were shipped directly to the construction site and fit perfectly into each of the 8 bathrooms, just as verified in the model. Without the DPI-7 Kit, Pepper would have been at risk to order dozens of pieces that did not in reality fit into the renovation as planned. This would have delayed the project timeline and resulted in a scramble to meet the deadline. Thanks to the DPI-7 and careful planning by Pepper, they were able to order with confidence and finish the project within the tight timeline, ensuring completion in time for the fall semester. Pepper Construction Group is a general contracting and construction management firm that has served the non-residential, private, and government sectors since 1927. Their expertise is recognized throughout the Midwest. With offices in Illinois, Indiana, and Ohio, Pepper ranks as the third largest contractor in the Midwest and the nation's 45th largest contractor, and 25th largest general building contractor.